I received another treasure in the mail today - finally. 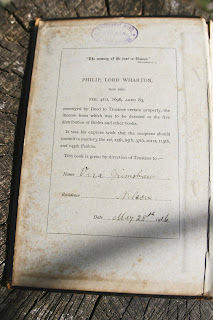 I purchased a Holy Bible from Great Britain - one that was printed, "By the will of Philip, Lord Wharton, 1696". The Bible itself is copyright 1891. 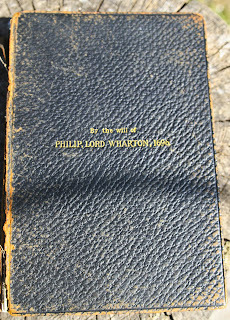 Here is a web site that explains who Lord Philip Wharton was. He was a Puritan who died in 1696 and, in his will, left monies to pay for the printing and distribution of Bibles to those who would memorize a certain number of Psalms, as listed inside the front cover. Evidently, all the Bibles that this estate has given out have the same inside front cover message. Imagine receiving a Bible because of the express wishes of someone who passed away in 1696 - it's as if Lord Philip is rejoicing in Heaven whenever someone is blessed in this way. Here are pictures of the Bible. As usual, for a clearer, bigger view - or to say it in the new Bloggie language, "embiggen" - just click on the image, especially on the last picture of the Bible, which shows the inside front cover with the inscription. 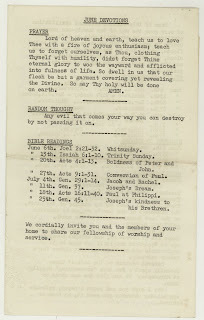 "We must learn to take our faith in the supremacy, the omnipotence of God out of the realm of doctrinal orthodoxy, and apply it to this situation where men's hearts often fail them for fear of what may be coming on earth; to be able to say, with quiet confidence that, even in the present world of tumultuous change, God is in control, that, even if men in their sin and stupidity press the fateful button that may unleash nuclear war, even so God's redeeming purpose in Jesus Christ will not be wrecked. Even if this vaunted affluent civilization of ours goes the way of the twenty-one previous civilizations we are still able to lift our hearts in praise to God Who sites above the water floods, Who is not at the mercy of the mushroom cloud, Who takes up the isles as a little thing, and Who can make even the wrath of man to praise Him." 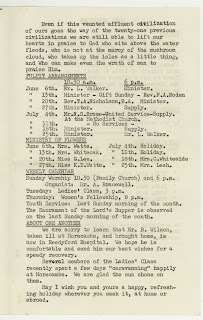 I can just picture an elderly Vera Grimshaw, who, I will assume, received the Bible as a gift in Sunday school at a young age in 1916. She is in church on a warm day in June or July 1965 with her lovely Bible and I'm sure she has on a suitable hat and appropriate church outfit for that time. Pillbox hats, like Jackie O's were still the rage. The Beatles had become a worldwide phenomenon and in the US, Lyndon B. Johnson was President. World War II was 20 years in the past, which, in today's context, would be like 1988 - not that long ago, still fresh in the minds of adults of that time. I was 9 years in 1965, a time I am quite fond of remembering, albeit with rose colored glasses. 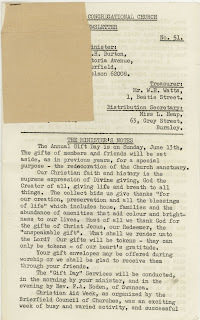 Please note that the little Gift envelope is still attached, so Miss Grimshaw (could she have been Mrs. Something Else - wouldn't she have added that to the Bible?) did not see fit to give a Gift that day, or she used some other means of conveying it. I came to the conclusion today that, when we picture the perfect place where we'd like to live, if we are truthful, there is no place that is perfect, except when we go back in time to our childhood. Like Dorothy in the Wizard of Oz, "there's no place like home" is very true. But even that, no matter how wonderful it might have been (or, for some, something they'd rather forget), it still is not perfect. 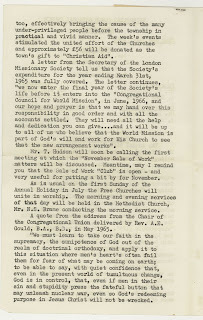 Home is Heaven for the Christian, and, looking at our world today, that lovely passage from Minister's speech in 1965 is as appropos today as then. My heart longs for Heaven as that is the only perfect place. Meanwhile, I will enjoy these sweet treasures that come my way in this life. What could be more perfect in THIS life than the Word of God. Have a lovely and peace-filled weekend. What a great post. I'm bursting with comments. First, I love it when I find inscriptions, highlighting, and other markings in old books because I can find out more about the owners--it makes them more real. 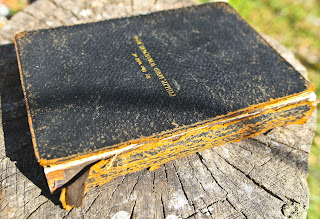 So how delightful that there was a story behind that Bible and the owner's name and a document. Second, what a well-written and reassuring statement you quoted. Third, funny that you should be reflecting about childhood like that--I've been thinking the exact same thing lately. Being a kid was so simple with so few burdens, so I could enjoy places and activities in full, without emotional baggage attached. Sometimes I feel tempted to go back and live there in my mind, and something holds me back. I think it's that I do view it in an idealized way, and those unfettered joys were temporary, in a way created by the wall of a stable home. I don't think God wants me to live there mentally and thus waste time. Or I just refrain from it, but can't fully articulate why I feel that I shouldn't. Maybe it would reflect a lack of contentment in my present circumstances. Or maybe, as you said, I should be longing for my real home. So where did the blog award come from? Congratulations. Florida is so beautiful year-around. We just now, in the last day of April, emerged from a long winter. Sigh. That's a big squirrel. I feel that finding this pamphlet inside the Bible was no accident - God meant for me to be comforted. I remember the cold war years, although when I was 9 I don't think I worried much - it was later in my mid-teens that I was petrified. The squirrel actually isn't as large as northern squirrels - it's just the size of the photo, perhaps. We don't have the beautiful trees that you do up north. I grew up in upstate NY, and the trees in summer are breathtaking. My parents' birthplace was upstate NY, so I spent a few years there, too. I want to take my girls to see it someday--in the summer, of course, when the wildflowers are out and when the rolling hills are green.